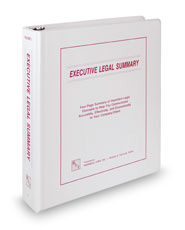 Executive Legal Summaries is a series that summarizes important legal concepts to help you communicate issues to your company or clients accurately, effectively, and economically. Over 435 summaries provide an overview of the various subjects in a concise format, giving you a document to share with your business clients. You do not have to take the time to write a summary of the legal principle involved.